They organize trips for youth to increase the level of awareness of other young people in the same situation. Tijwall Safar is a group, that organize trips for youth at least once a month. The Participants usually comes from all over Palestine. Stop The Wall joined them for one of their trips, where the goal was to see the Jordan Valley, in the eastern part of the West Bank. Jordan Valley is located in the so-called "area C", and hence under complete Israeli control. The Jordan Valley and the communities living there are at the front lines of the Israeli policies of ethnic cleansing and suffer with particular intensity policies such as home demolitions, military attacks and an unending number of harassment. Tijwall Safar regularly organizes meetings and activities between Palestinian youth in order to increase the circulation of information and the level of awareness about the effects and mechanisms of the Israeli occupation in different areas of the Palestinian territory. Throughout the day, the Tijwall Safar youth had the opportunity to walk through the Valley, a way to also make them feel closer to the region, identifying it as a land that also belongs to them. 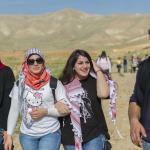 Considering that one of the goals and main features of the occupation is the fragmentation of the Palestinian people and hindering communication between different regions even within the West Bank, the initiative to promote closer ties of young people from urban centers with what is happening in the rest the territory is a crucial tool to create joint struggles. In addition to the walk and a picnic, participants were briefed on the situation of the Valley, particularly on the issue of water. And they could witness by themselves, they encountered several water reservoirs and pumping station run by the Israeli national water company Mekorot along the way. Mekorot promotes a true water apartheid in the Jordan Valley and other locations in the West Bank and in fact, all those water supply systems in the occupied Palestinian territory serve almost exclusively settlers. Even in cases where the pipes run directly through Palestinian fields and communities, Palestinians are not allowed access to this water. If you would like to get information about the group, visit their Facebook page.